Within the darkness of the New Moon in Taurus arriving April 26, maintaining receptiveness to self examination through our senses and intuition will help guide intention toward the necessary shifts needing to be embraced within the cycle ahead. This is a particularly fertile New Moon to plant seeds of future visions within, yet there is also a pulsating volatility under the surface requiring alertness and thorough grounding in the changes of the moment. The New Moon is applying toward a harmonious sextile with Neptune while being ruled by Venus in her exaltation of Pisces, yet Mercury retrograde in Aries applying to a conjunction with Uranus suggests tumultuous tides of change needing to be navigated rather than calm waters. Taurus as the fixed inner home of Venus brings support to set intention at the New Moon based upon one’s most resolute and steadfast inner values. Being in integrity and building a solid foundation based upon essential desires and principles is always the ideal way to go about manifesting what you want to happen, yet the underlying unexpected quality of the New Moon means things most likely will not be able to go completely according to plan. It will be necessary in the cycle ahead to be flexible and avoid stubbornly refusing to negotiate and mediate difficulties as needed. A solid focus will be on refusing to compromise one’s integral inner values, yet being open to modify and alter the less essential aspects of plans so as to flow smoothly with currents. There is a great deal of essential dignity involved in the New Moon, as Taurus is the exaltation of the Moon and its ruler Venus in Pisces is also in a sign of exaltation. As a result there is natural power available to inject into dreams and plans being developed. Venus is at the final degree of Pisces, and will finally leave the sign of the Fish a couple of days after the New Moon. For almost the entirety of April we have been experiencing Venus inhabiting the final degrees of Pisces while forming a square to Saturn in Sagittarius and a conjunction with Chiron. Within the past month any difficulties experienced in relationship or work has helped clarify the true passions of our heart as well as who or what is deserving of our full commitment. Saturn has also been bringing awareness to what needs to be released and let go as well as what needs to be strengthened and fortified more securely. Vitally, however, Venus has finally separated from her square with Saturn and is gaining greater brightness and height each morning as a Morning Star. Since the time of ancient astrology Venus has been known as the light bringer, brilliantly beautifying morning skies as a herald of our day to come. The light Venus is now shining at dawn has been tested and strengthened by Saturn. The New Moon signals a time period to get to work on the inspirations and desires that not only have passed the test of Saturn but have grown in depth and strength. Venus as Morning Star is full of courage and willingness to face whatever challenges the day will bring in order to create and find fulfillment. Venus at the final degree of Pisces makes the Taurus New Moon opportune for feeling deep within and allowing heartfelt yearnings to inform our intentions. The wildcard element of the New Moon is the conjunction of Mercury retrograde with Uranus, a catalyzing and volatile aspect that will become exact a couple of days after the New Moon. Just as we recently experienced an extended time period in which Venus was forming a square with Saturn, we now will be experiencing an extended time period in which Mercury is united with Uranus while forming a trine with Saturn. The fact that the union of Mercury with Uranus is forming a trine to Saturn suggests that it will be possible to find ways to structure and materialize groundbreaking insights so that we can take our understanding to a deeper level as well as find forms to express realizations through. The lunar cycle ahead will be ideal for going deeper into whatever research or work you have been working on but until now have not synthesized or comprehended fully. Amazingly Mercury will still be united with Uranus and in trine with Saturn at the Full Moon in Scorpio that follows the New Moon on May 10, the vital difference being at the upcoming Full Moon we will be experiencing a visible Morning Star Mercury that is also direct. With Mercury currently invisible and applying to its first conjunction with Uranus at the New Moon, it will feel like breakthrough insights are intensifying in our subconscious and on the precipice of erupting into conscious awareness. By the time we reach the upcoming Scorpio Full Moon on May 10 we will have a much stronger grasp on the information and events entering our life in correspondence with Mercury and Uranus. At the New Moon its important to realize you won’t have all the answers and you be gaining a more solid understanding of new developments in the weeks ahead. Memory and how we work with memory, including the stories we create and tell about our lives, is always important during Mercury retrograde but even more so considering the long union of Mercury and Uranus we will experience in the weeks ahead. Uranus transits can coincide with unexpected change that can feel shockingly difficult, yet the shattering impact of Uranus also brings liberation from past dynamics. The union of Mercury retrograde with Uranus brings an invitation to release attachment to old memories and stories we have been telling ourselves that have been limiting us. Mercury will be able to support meditation, ritual, ceremony or other means to alter our relationship to the memories we now realize have been getting in the way of receiving joy and love and embodying authentic presence. A few days before the New Moon on April 23 we experienced a balsamic crescent Moon in Pisces able to be seen before sunrise close to Venus rising as a Morning Star. This was the first visible union between a waning crescent Moon and Venus in the predawn sky in the current synodic cycle, a hallmark of the Morning Star phase of Venus in which she aligns with a waning Moon each lunar month. From our experiences of April with Venus slowly moving back and forth through Pisces we can distill what we have learned into the seed we plant to nurture in the soil of the Taurus New Moon. There is an openness and vulnerability able to be accessed that renounces over attachment to control while embracing the sensual centeredness of Taurus. Venus in Pisces ruling the New Moon is also in a harmonious sextile with Ceres at the end of Taurus, providing another symbol of drawing from within to manifest greater abundance and sensuousness in the world. In the days following the New Moon both Venus and Ceres will ingress into new signs while remaining in sextile, with Venus entering Aries and Ceres entering Gemini. Venus in Aries will incite a quicker tempo in the lunar cycle ahead, especially once Mercury stations and begins moving direct again in Aries. Venus will no longer be in a sign based square with Saturn, but while she may feel less encumbered by the scythe of Saturn there will be a strong karmic feel to her moving back across the degrees of Aries that she previously moved retrograde across. The lunar cycle ahead will be the third time that Venus has moved across the first face of Aries, and so we will gain greater greater realization during the next few weeks regarding the changes brought about by the Venus retrograde of 2017. In addition, Mars in Gemini is separating from a square with the lunar nodes at the New Moon, calling attention to this being the final lunation we will experience with the North Node of the Moon in Virgo and the South Node of the Moon in Pisces. At the upcoming Full Moon in Scorpio the North Node of the Moon will have entered Leo and the South Node of the Moon will have entered Aquarius. Mars moves fast in Gemini and can take on multiple tasks simultaneously, yet its square to the lunar nodes suggests the necessity of taking a moment to center within and listen to inner guidance before impulsively launching into reactionary action. The shift of the lunar nodes into Leo and Aquarius is one of the major events of 2017, and so with the nodes still in Pisces and Virgo at the New Moon we have the opportunity to integrate all of the lessons we have been learning with their transit since November 2015. The many changes that have coincided with the transitory nature of the nodes being in mutable signs are now coming to a close, and we will be embarking on a new journey with the North Node in Leo that will help feed greater creative actualization and centered presence. The New Moon falls in the first face of Taurus associated with the Five of Pentacles card illustrated above by Pamela Colman Smith. Many interpret this card in association with worry and fear over not having enough money or resources, or experiencing bodily or material hardship. Yet the poverty stricken figures in front of the stained glass window of a cathedral suggest that resources can be found in even the most dire of circumstances, as churches and other spiritual communities tend to be the place that those in need have available to turn to for charitable giving of sustenance. Mercury rules the first face of Taurus, linking the commerce of Mercury with the fertile earth nature of the sign of the Bull. Mercury makes the connections we need for our livelihood, and in the first decan of Taurus we discover our capacity not only to gain enough resources for our own survival and greater prosperity, but to also contribute to communities that can offer assistance to those in greater need. 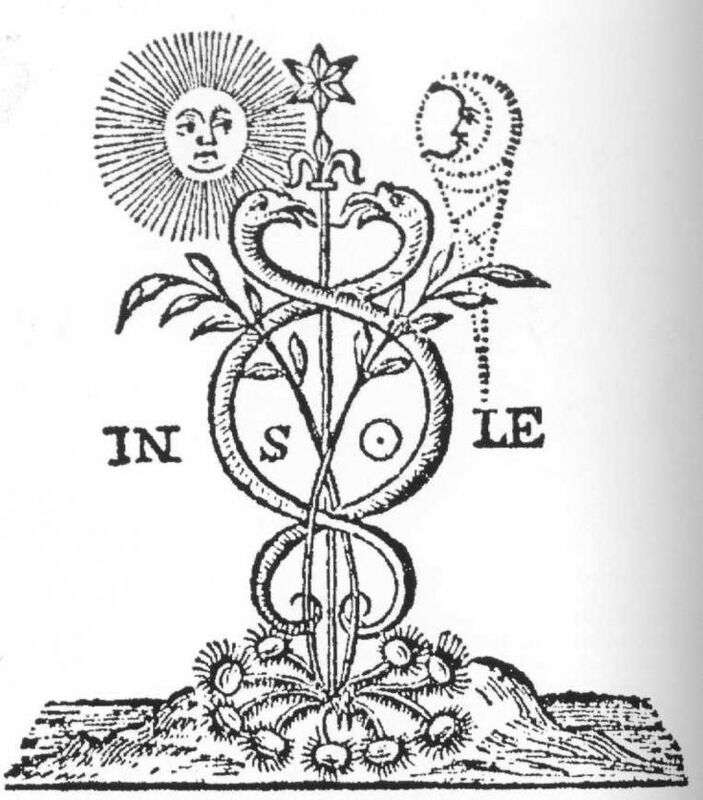 Austin Coppock in his book on the decans 36 Faces ascribed the image of “The Plow” to the first face of Taurus, noting the “face is traditionally connected to all of the sciences necessary to draw forth fruit from the land,” adding that we must also realize that “the mind, heart and body are all ripe fields, which offer abundance when cultivated” (p. 69). Coppock noted that though the first decan of Taurus “reveals the ways one may work with whatever one has to gain more,” that the images and interpretations associated with the Five of Pentacles card bring up the shadow of fear that we will not have enough money, food, or material resources and that bleak times may arise if we disengage from our constant planning around cultivating resources. Coppock concluded that the threat of not having enough in the future inspires us to work hard and plan for how to gain enough resources not only to get by in the moment but to be able to save for later times we may be in need. Coppock also added that the ancient and fragmentary Hellenistic text 36 Airs ascribed Charis to the first decan of Taurus, linking the Charites of mythology to the charity we can find in the image of the Five of Pentacles card as well as the meaning of the first face of Taurus. The Charites are the same as the three Graces you are most likely familiar with, commonly known as Splendor, Mirth, and Good Cheer, though various traditions have additional names as well as numbers for these charming and fertile goddesses. Coppock used the Charites in 36 Faces to give warning that overly focusing on the pleasures of mirth associated with these creatively fecund deities may cause us to become distracted from the work and planning we need to engage in to secure needed resources, suggesting we must strike a balance between the toil of the plow and the pleasures of the Graces. Yet striking a balance between work and pleasure does not require going back and forth between a polarity of opposites, and the fact that the exaltation degree of the Moon also occurs in the first face of Taurus close to the degree of the Taurus New Moon suggests there is a way to find good cheer and pleasure in the effort we put into not only acquiring our own needed resources but also enabling us to offer assistance to those in need of help. The Charites also have association with the underworld and the Eleusinian Mysteries, bringing further connection to the psychopomp Mercury being the ruler of this fertile face. Since the current Mercury retrograde began in the first face of Taurus, as well as Mercury’s regenerating conjunction with our Sun, there will be wisdom found in embracing pleasures, allowing ourselves to receive joy, and engaging with the spirits of abundance who lay at the root of creative action that brings both happiness as well as material stability. The wisdom found within our bodies flows more freely with the quicksilver of Mercury when feeling the pleasures and good cheer of the Charites.